A Simple Schlage Lock Cylinder. You’ve heard the saying, “you get what you pay for”, and that’s especially true when it comes to locks for your house. On the surface, all locking door handles look pretty similar, right? Here at Keyway Lock & Security, we spend a lot of time installing, opening and repairing locks, and we can tell you that low-cost locks from the box stores are the easiest to open – even when we don’t have a key available. 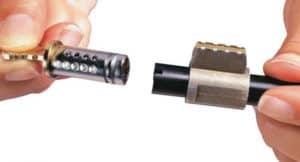 Lock manufacturers save money by substituting high-quality materials like solid brass with plastic and die-cast metal, and in turn, these bargain-priced locks are easier to force open and more likely to fail in less time than you’d expect. Consider this – with the price of real estate these days, why would you pay hundreds of thousands of dollars for a home and then cut corners by securing it with a cheap, ineffective lock? Ask us about a high-security lock today! A home burglary happens every 13 seconds in the United States, and 23 percent of the time criminals gain entry through a first-floor window. Here in Chicago, it can be tempting to leave your windows open during the hot humid summertime – and the bad guys know that. Never, ever step out with your windows open – not even for a few moments. And because home invasions and break-ins can happen even when you’re at home, securing your windows with bars, anti-lift devices, and locks that prevent the window from opening too far is a smart way to keep you and your family safe. Also consider installing window alarms, reinforced glass, and even plexiglass – it’s about 10 times more shatter-resistant than traditional glass is. Don’t forget – thieves look for homes that have places to hide near the windows, such as large planters and shrubs that they can use to take cover from security cameras, pedestrians, and you. Keep hedges trimmed well away from your house, and cut them low so you have a clear view of your first-floor windows. While it might be shocking to think about, the fact is that many home invaders and burglars don’t try to be stealth – they simply use brute force to kick their way in. In fact, most home break-ins involve forced entry through the front door because weak door jambs make it simple for criminals to kick the doors in. If your door jambs aren’t reinforced, it doesn’t matter what type of deadbolt or locking mechanism you have on your door. If you’ve replaced your deadbolts with a keyless lock that’s controlled by a keypad, your home might not be as secure as you think. Most keyless entry locks require a 4-digit code, and all too often, homeowners set codes that are incredibly easy to guess by using the last four digits in their zip code, phone number, or even their house number. Worse yet, many people set their code and never bother to change it – that means the buttons start to fade, which gives criminals a head start on guessing the access code. 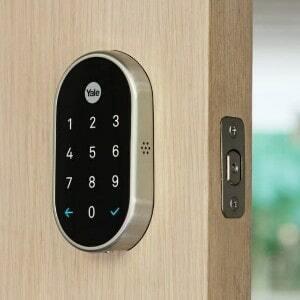 All they need to do is examine your keypad for signs of wear and they’ll be able to quickly narrow down the possible combinations for your deadbolt. While it’s true that home security systems can’t actually prevent a break-in, having a high-quality system installed – and making it visible to would-be criminals – goes a long way towards deterring criminals from targeting your property. After all, thieves tend to seek out ‘soft targets’ – places where they can break in, take what they want, and get out without being seen. High-quality home security products like motion-activated lights, high-definition cameras, and motion sensors are all smart ways to help make your home less appealing for burglars – but only if these products are installed correctly and kept in good working condition. Simply having a few cheap cameras positioned around your home isn’t enough to make your home safe – you need to have a security system that covers all possible points of entry. 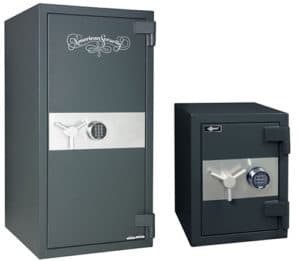 Secure Valuables In A Fire Rated or B-Rated Safe. In the past home, break-ins were usually all about stealing items that criminals could quickly sell for cash – things like televisions, computers, electronics, and jewelry were popular targets. Today, criminals are more likely to be looking for something that’s tough to put a price on – your identity. Thieves often skip by the fine china and artwork to head straight to the master bedroom, since that’s the place where most people tend to store valuable documents like their passports, birth certificates, marriage license, and banking information. If you don’t have a safe in your home, it’s time to get one. This is an easy way to protect your identity against thieves and eliminate the endless hassles that come with having your identity taken away. Want To Know More About Home Security? Take a look around your home – can you spot any other vulnerabilities that could be putting your home security at risk? To learn more about what you can do to make your home a safer place for you and your family, contact our team of home security experts here at Keyway Lock & Security. We offer home security assessments that identify potential security problems at your property, recommend effective, real-world solutions, and perform all the locksmith work that’s needed to decrease your chances of being targeted by a burglar or home invader.